For any who have deleted their in frustration. Here’s a zipped copy of system files and structure I have on mine. You will need to make sure your watch is formatted to MS-DOS (FAT32), unzip the files on your computer then drag them onto the watch folder. Wifi Mobile Broadband – At Last It’s Here! I have just updated my previous post on wifi mobile broadband. The need for this hasn’t gone away, and at last the device is out (it has been for a while in the US) that makes it possible. Posted on November 24, 2009 Author SimonCategories Tech CommentTags mobile boradband, wifiLeave a comment on Wifi Mobile Broadband – At Last It’s Here! I have just received my Amazon Kindle and thought I would give my impressions of what the device for use in Australia. Firstly I should explain my motivations in buying a Kindle. The first reason is that I, like many people, have a file on my computer called “to read” which just fills up and virtually never get read. Most of these are pdfs or Word files and I thought that the Kindle might mean that I get them off the computer and onto a device that is easy to read on. I also have a library of pdf reference books that I again need to get off the computer and actually read! Second reason was that I like both the environmental benefits of not having a paper copy of a book. I’m sure you’ve seen the email signature that tells you how many litres of water it takes to make 1 sheet of paper. I have also seen some research on the energy requirements, and paper is higher than steel per tonne produced, which really surprised me! Well imagine being able to reduce that. Thirdly, I have relatives coming over from the UK and the ability for them to read the UK papers is a big cost saving and convenience for them rather than buying international versions from local shops. Lastly I would like to read more books and this might give me the ability to do so. The ordering process on Amazon is seamless as usual, and a Kindle account is created for you so that you can buy books etc without having to enter your credit card. This is a great convenience and I guess we won’t worry about security at this point! Amazon have a paid for service where you email them files and they convert and send them directly to your Kindle. This is the service you hear about most often, and I’m not sure why. I can only ever see using this if I want someone to email me a document when I am out somewhere (hopefully on a beach). Amazon also have a free service where you email them files and they convert and email you back a link for you to download them to your PC/Mac. This seems ideal, as if you have emailed them, you are going to be at your computer and you typically get the file back in under 5 minutes! Using this service the conversion of pdf’s (Kindle doesn’t natively support pdf’s) was ok. With technical books there were some issues, but they are certainly readable. When the Kindle arrived (30 minutes after the tracking told me it was still in LA) packaging was nice. Understated, almost playing on the environmental side but at the same time giving an almost Apple quality feel. You don’t want to keep the box like you do with an Apple product, but at the same time it’s very nice. First impression of the product is really the screen. When you take it out of the box, there are some instructions on how to get started. At first glance I thought those were printed on the protective film, but they were actually on the screen! Graphics look incredible, very detailed with no obvious pixels. Yes, the screen really is stunning. I had seen mixed reviews of this feature, but I’m guessing that the people who don’t like it, may have a problem with contrast perception as the light grey background with black text is certainly different from the pure white of an LCD. However, as there is no backlight, it just doesn’t have the harshness of a monitor, and you really do get the impression you are reading a printed page. I dutifully plugged the USB cord into my iPhone charger and left it for 4 hours. After that time the orange charge light was still on but I thought that it should be enough. Once I started to use the device though I was finding that the controls were very laggy. You seemed to have to press the next page button way too hard and sometimes it just didn’t seem to work at all (see later when this was resolved). I also noticed that the battery indicator was still showing that it was plugged in, which it wasn’t! After about an hour I started getting battery warning and shortly after it locked up with a “Battery Dead” type message on the screen. If you have a computer available, please try charging your Kindle using an existing USB port. Many 3rd party charges are not able to sufficiently charge the Kindle. It worked, but I have to say that does give me a few problems, in that I have all sorts of USB chargers and seemingly none will work. I really don’t want to have to drag a laptop round with me just to charge a Kindle. Also the advertising saying that you can use it without having a computer is just not right, if you need a computer to charge it. I guess here that there is a good market for a 3rd party charging product. Note here that the version I received did not come with a US power plug, so I couldn’t even use that and a converter. It seems that some may have judging by other reports. After that little disappointment it did charge and rebooted. The good news was also that this seemed to completely cure the lag problems I mentioned earlier. Buttons are now responsive enough so you can just roll your finger over them and the page turns (yes I still think I’m reading a book). I have now used the Kindle at night and during the day in the house, and at a McDonalds sat outside. The screen is very legible and you really do forget you aren’t reading a book. Usability wise I would say a big thumbs up from me. Of these only one was available, which was very disappointing. It was a lot cheaper than a physical book, but we really need more content. The frustrating thing is that I know most of these are available in the US. Come on Amazon and publishers, get yourselves sorted out and embrace the future rather than clinging to your old business model. I am hoping that I can buy in other formats and can use Stanza (see above) to convert to Kindle. However, I do have my doubts about this as this won’t work if the book is copy protected, and I’m sure they will be! The content I did get was a newspaper and a few book sample. The newspaper is on a 14 day free trial (remember to cancel if you don’t want to be charged for it after 14 days). I have to say that although not the same as reading an actual paper, in many ways I like this better. It is more like a web experience with articles arranged into groups you can navigate through. I think for people used to a physical paper it may take some getting used to, but if you get your news from the web, it is great. There is no doubting the convenience too with the paper being delivered to you anywhere in the world! The one downside is that these aren’t cheap. I will probably not continue my subscription, but would if they were halve the price. Book reading I can’t comment on too much. It really is just like reading a book with the added conveniences that it isn’t as big, it saves your place if you fall asleep reading it and you can set the text size and column width up just how you like it. Doesn’t come with and Australian charger and you can’t use a standard USB charger. You thereefore have to plug into a computer to charge. There is not enough book content on the Australian Kindle store. There are things that I haven’t mentioned here including the basic web browser, which doesn’t work in Australia, wikipedia access which has been reported to work, but I haven’t been able to get going. However I am reviewing just as a reader for the moment and will hopefully get to those later! – Septimus Heap book series was on the Australian store, I bought the first book and want to buy more, but it has now disappeared. I can only assume that Amazon didn’t have the rights to sell it in the first place which leads on nicely to point 2 below. – The Australian Store just doesn’t have enough books on it. I am finding it hard to recommend the Kindle when the number of books I can get is so limited. I have bought 2 books so far and had sample chapters of about 5 more but you really have to choose by what you can get rather than what you want. – I also have an audible account and should be able to play audible content. When I try it asks to validate the device with audible but when it goes to do this it tries to connect then fails. This means I can’t play audible content at all. – I have tried converting quite a few technical pdf’s and despite my comments above, they don’t usually convert well enough to read. I really think they should have native pdf support in the Kindle, they have it in the DX, the iPhone has it, so I’m sure the device is capable enough. This would particularly help me (and many other techies) that tend to buy pdf books, and have a heap of pdf white papers we want to read on our computers. Having said that the problem is particularly when there is code in the books as it doesn’t keep the indenting, which makes it a nightmare to follow. Other books seem to convert okay, though native support would still be better (specially when there are side bars with additional info). Having said all that, I am still enjoying reading on the Kindle, and it is making me read books socially rather than just work related topics. Updated software just coming through including PDF support. I will update this post when I have given it a try. I have finally tried the charging tip suggested by Andrew. It does seem to charge the Kindle quite happily if you plug into your printers USB input port (the one that reads the memory sticks on the front of the printer usually). It does lock the device while you are charging though, and I would advise turning the printer off before you pull the lead out, just in case. Overall though I find charging through the printer more convenient than via the computer. The girl who kicked the hornets nest – The above series was really entertaining and is definitely worth considering. The writing in the first leaves a bit to be desired but the story is good and after this one the 2nd and 3rd books were good. There is also a variety of styles here the first being a bit of a mystery, the second a thriller and the last a court room drama. Personally I liked the second best. By reason of insanity – I really struggled with this one to about the 15% mark, from then on it has had me hooked. This is a courtroom drama with a serial killer and all sorts of things thrown in. It was only $2 when I bought it and once you get past 15% it is excellent. Looking forward to finishing it tonight.! Judging by my past post you’d probably think that today I would be celebrating the proposed structural separation of Telstra. I guess I am, but the way it’s being forced on them, although good for consumers, is not good for business. Government should not be able to force a commercial company to do anything, or prevent them from bidding in auctions. “I agree with splitting Telstra, it should have been done ages ago, but …I really can’t agree with the way this is being done. How can the ACCC stand by and let the government say “and by the way if you don’t agree we’re not going to let you buy spectrum”. I always thought one of those C’s in ACCC stood for competion? Obviously not! And what has Foxtel got to do with anything? Seems like it would just be a way to punish if Telstra don’t agree! Telstra is a commercial enterprise, the government created this mess by selling them, they shouldn’t now be able to impose new conditions on them. The only MP4 Video Player that doesn't play MP4's? 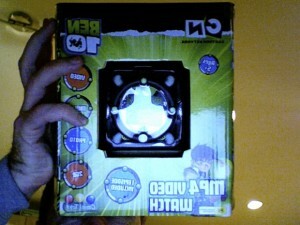 I have just bought a Ben10 MP4 Video watch from Targets sale for $99. In theory this looks like the product I promised to make my son from a video photo frame and an old Ben10 watch surround, so why bother making it? This way it has custom Ben10 animations and everything right!? First things first. What’s in the box. The box itself says it includes Earphones, USB Cable and CD-ROM. Open it up and guess what, no USB cable. That’s not such a problem though as it’s the micro USB sort that often come with a camera, so I had a couple of those knocking around. STOP THE PRESS – I’ve just found it. It is about 2cm long and part of the strap. One thing missing from the box…instructions. There are none. That’s right none at all. Not even a brief explanation of the buttons. I guess that might be on the CD, but it is one of those microsize CD’s and I have a slot loading drive on a Mac, so I can’t have a look to find out. So I searched the web and nothing (hence this post) the supplier Canal Toys has a website that is “Under Construction”. Okay, so I have a few set backs here, but no problems, according to the box it will play “mp4, avi and wmv (software included)”. I can’t get to the software as it’s on the CD, but I have Quicktime Pro, Handbrake and a number of other video converters that will move things over to mp4 and avi just fine. Plug in the watch, and up comes the disc with no problems. The file system is easy to see so I navigate into the folder and ….the file is smv, not mp4 or any other format. I had played the video before and found that it looked a bit rough with a very low frame rate but I had put that down to some dodgy encoding but on further investigation it seems that the only thing that will play is this SMV format (which was originally designed for the Super Nintendo to give you an idea of quality). Hmm an MP4 Video Watch that doesn’t play MP4’s!! I have looked for a converter but with no luck for the Mac. By the way the ‘speakers’ are so quiet that you can’t even hear them well in an almost silent room. Think taking ear phones out of you ears and listening to those. The next thing I tried was putting mp4’s in there and see if it will read them. I dragged on mp4’s formatted to 160x128px and 15fps (to be safe). Then tried to unmount the watch. It unmounted, then remounted. I tried again and got the same. After multiple attempts I had no choice and just pulled to cord, which corrupted all the data despite having made sure there was no writing going on. Now I have a watch even without the free Ben10 episode included! At this point the problems have ceased to make the device fun, and have basically crippled it to the point that it is impossible to use and the only thing I can do with it is try to take it back. I haven’t even mention that while trying to navigate the watch I managed to crash it to a shell script 3 times! This is a really, really disappointing product. Any Ben10 fan should love it, but instead it doesn’t include what it should do in the box (no printed instructions is unforgivable), it doesn’t work at all with a Mac (no compatibility info on the box), even if it did, the video was poor, audio via the speakers was non existent, and it crashed to a shell prompt 2 or 3 times in the few minutes I played with it. I haven’t even mentioned the potential legal problems I’m sure the company could get into by calling the product an mp4 video watch when it won’t play mp4 videos! What is really disappointing is this stuff isn’t that hard and for $100 ($130 rrp) you should get native mp4 support out of the box, and with a decent frame rate. Note that there seems to be a few versions of this watch about. Others seem to have a 1.3-1.5″ screen. This one was 1.8″. The product again is the Ben10 MP4 Video Watch officially endorsed and supplied by Canal Toys and bought at Target in Australia in July 2009. Avoid this like the plague even if your kids beg for it! What Speed Will We Get From the NBN? I have just been reading an article on the capacity of the data cables going from Sydney through to Guam, and then on to the US. Currently it stands at 4Gb/s but with the new cable from Pipe Networks that should increase over time to 6Gb/s. The totally capacity coming into Australia when this is up to capacity will be 6Tb/s. The NBN will provide data connections at 100Mb/s or 0.1Gb/s. That means that just 60,000 connections at a full 100Mb/s, or assuming that maybe 20% of households are on the net at the same time connecting to the US (20% of 8.5M households is 1.7M connections) gives just 3.5Mb/s per connection. Okay I know that there will be local caching, but this is going to need to be huge in order for us to see more than a connection at roughly the same speed as ADSL. Posted on May 19, 2009 Author SimonCategories Tech CommentTags Connection Speed, Guam, NBN, Pipe Networks4 Comments on What Speed Will We Get From the NBN? I have recently had the misfortune of having the sound on my Macbook going off after about 10 minutes, and a red light appearing in the port. After much research I found out that this is actually a VERY common problem (c’mon Apple you should fix this up). It seems to relate to plugging non-Apple plugs into your headphone port. Mine certainly happened when I started plugging in a lead to go to some external speakers. The problem is caused by a little switch inside the port which is there to sense whether they plug you plug in is optical or not. The larger plug size seems to cause it to somehow waver between detecting it as an optical port and not. The standard advice to fix this is to ram your plug in and out a few, or to stick something in there and fiddle around at roughly the 7 o’clock position. I tried this and it worked for 10 minutes, then went off again. This seems to have done the trick for me and I have now been complete with audio for the last 4-5 hours! Hooray! I am going to start a new rumour that the iPhone will include an HD video camera as per the Flip MinoHD (just bought by CISCO as the next big thing) and the new cameras from Kodak/Sony etc. The video will synch straight into iMovie to give the iApps integration and will synch with iTunes. I’m not sure whether this will actually happen, but it makes sense and would be very cool! C’mon Apple…..can’t wait until June! NSW Schools Lenovo Netbooks with Photoshop! I have just read that the NSW OLPC for schools system has approved Lenovo IdeaPad S10e netbooks with Adobe Photoshop, Flash and Dreamweaver on them, as well as ‘free’ versions of Windows and Office. I have to say that there are a few issues I can see here. Firstly free software from MS!? There is no such thing as free! Even if it is provided free, the cost is that MS will expect a return by pushing the user, and the school down the Windows route rather than Mac or Linux. Not that good for a department of education to get suckered into that one! Second issue is Flash, Photoshop and Dreamweaver running on a netbook with 1GB of RAM and integrated graphics card on a 10″ 1025×576 screen! [b] You have to be kidding me! [/b] Maybe you could get them to load up, but do any work! Checking Adobes website for PS CS4 they require a 1.8GHz or faster processor and a 1024×768 screen, Flash recommends a bigger screen and Dreamweaver requires a 1280×800 screen. Obviously these netbooks don’t meet this requirement. This is not good for Adobe or the students. The students will get frustrated with the UI and slow or none existent performance and Adobe will lose customers as they will think their software is buggy. Oh, and I should add that we will pay for this too. Posted on April 3, 2009 Author SimonCategories Tech CommentTags Lenovo IdeaPad S10e, NSW, OLPC, school2 Comments on NSW Schools Lenovo Netbooks with Photoshop!